Mogadishu (AFP) - Somalia's president on Monday gave a defiant warning to Shebab insurgents a day after they killed at least 13 people in a bomb attack on a hotel that houses several diplomatic missions. The suicide vehicle attack, the latest in a string of bomb blasts and killings in the war-torn Horn of Africa nation, came as US President Barack Obama left neighbouring Kenya and headed to Ethiopia, both key nations contributing troops to the African Union force battling the Al-Qaeda-affiliated Shebab. The White House strongly condemned Sunday's "abhorrent" attack. 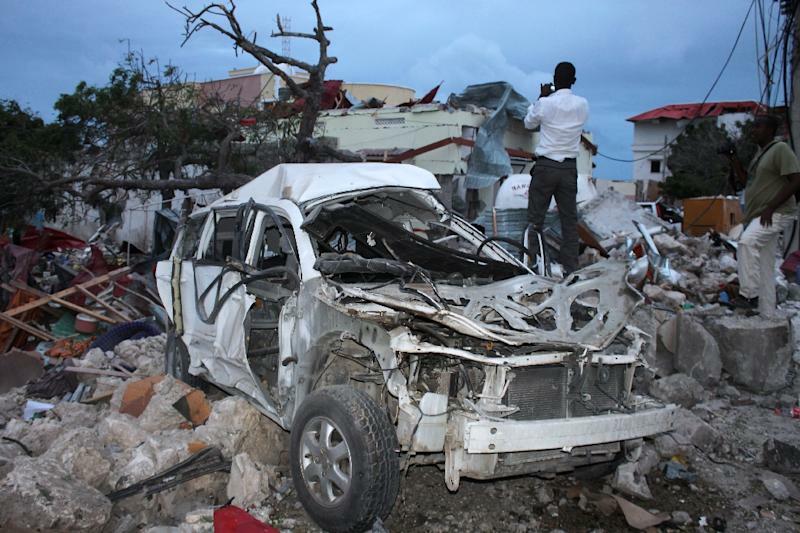 "The devastation was huge, and so far 13 people, all of them innocent civilians, have been confirmed dead," Somali government security officer Ahmed Ali said. "Some of the wounded died last night, while other bodies were recovered under the wreckage of nearby buildings." Initial reports had put the death toll at six. The Jazeera Palace hotel is home to the diplomatic missions of China, Qatar and the United Arab Emirates, and is popular among Somali government officials and foreign visitors. Beijing said Monday one of its embassy staff was killed and three others slightly wounded. AU troops helped rescue survivors, including Kenya's ambassador to Somalia, spokesman Paddy Ankunda said. 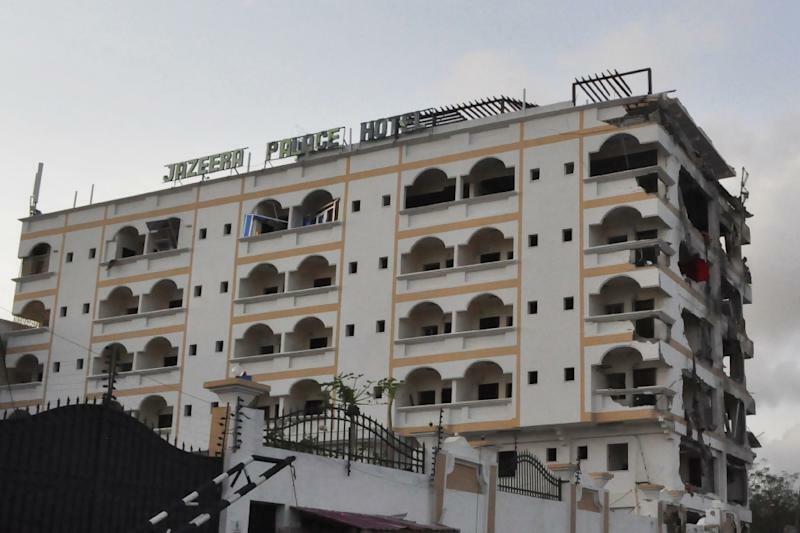 The hotel has also been the target of Shebab attacks in the past, including in 2012 when suicide bombers stormed the hotel while President Hassan Sheikh Mohamud was inside. "This was an attack on a symbol -- the Jazeera Hotel was a place where the international community met their counterparts in Somali politics, business and civil society," he said in a statement Monday. "But I have a message for the terrorists: the Jazeera Palace will be rebuilt and it will soon be back in business. That is how we respond to callous attacks such as this -- attacks that, as is so often the case, harm only innocent Somali citizens and our international colleagues who are here to help." Journalist Mohamed Abdikarim, who worked for Universal TV, was also among those killed, the National Union of Somali Journalists said in a message of condolence to his family. 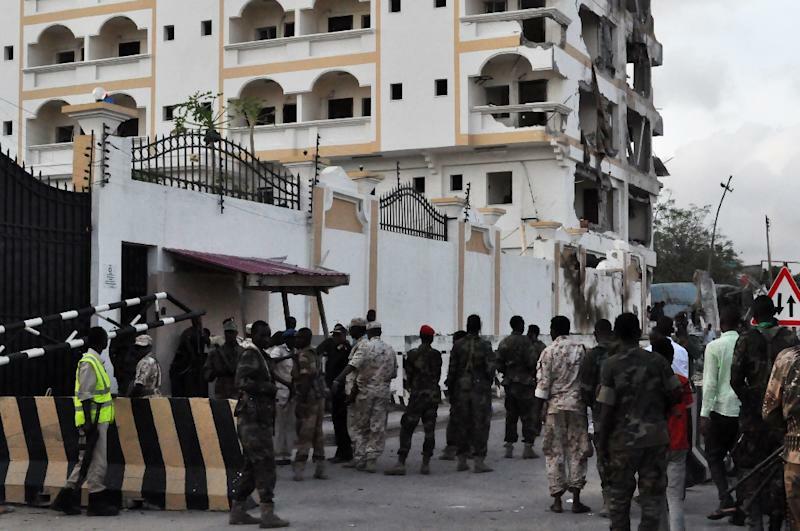 The Shebab said the suicide bomber had attacked the hotel "in retaliation for the killing of dozens of innocent civilians" they claimed had died during attacks last week by Ethiopian forces against Shebab bases in southern Somalia. The hotel was torn apart by the explosion, demolishing the side of the six-storey building and sending a thick plume of smoke high into the air, AFP reporters said. "This attack is yet another reminder of the unconscionable atrocities that terrorist groups continue to perpetrate against the people of Somalia," US National Security Council spokesman Ned Price said in a statement. The Shebab are fighting to overthrow Somalia's Western-backed government which is propped up and protected by the 22,000-strong AMISOM force. The US president, speaking in Nairobi on Saturday, said that while the Shebab had been "weakened", the overall security threat posed by the group remained. "We have been able to decrease their effective control within Somalia and have weakened those networks operating here in East Africa. That doesn't mean the problem is solved," Obama said. "We can degrade significantly the capacity of the terrorist organisations, but they can still do damage," he added. Somali government and AMISOM troops last week launched a fresh offensive aimed at flushing the insurgents out of rural areas in southern Somalia, in an operation involving Ethiopian and Kenyan forces. Deployed to Somalia since 2007, AMISOM has helped push back Shebab across much of the country's south, retaking towns and territory the group had held for years. US drone strikes have also taken their toll on Shebab, killing senior commanders, including the group's leader Ahmed Godane in September last year.